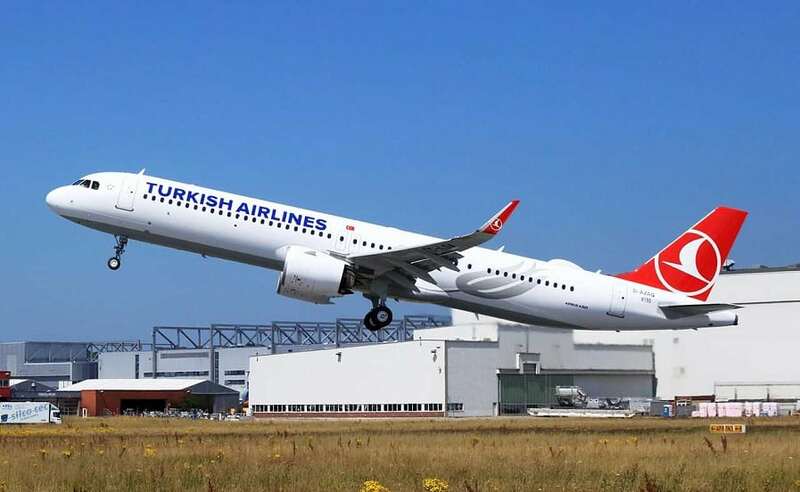 Turkish Airlines (THY) took delivery of the first A321neo in Cabin Flex configuration at the Airbus Facilities in Hamburg, Germany. This version is the latest addition to the successful A320 Family. By applying modifications to the fuselage, it enables flexible cabin configurations for up to 240 passengers. Turkish Airlines will operate the aircraft in a configuration with 20 seats in Business Class and 162 in Economy Class. Compared to the previous A321 variant, the most visible modifications are a new rear section and a modified passenger door configuration, where the door located forward of the wing is removed and new overwing emergency exits in the centre section are introduced. The A321neo in Cabin Flex configuration is an option today and will become standard for all A321neos around 2020. The A321neo in Cabin Flex configuration is also the base for a longer range variant known as the A321LR. The A321LR has an increased MTOW (Maximum Take-Off Weight) of 97 tonnes and a third underfloor fuel tank allowing airlines to increase its range to 4,000 nautical miles for intercontinental flights. With over 1,900 orders to date, the Airbus A321neo offers a reduction in fuel consumption of at least 15 percent per seat from day one and 20 percent by 2020. The Airbus A320neo family (neo for new engine option) is a development of the A320 family of narrow-body airliners produced by Airbus, the original family is renamed A320ceo, for current engine option. Launched on 1 December 2010, it made its first flight on 25 September 2014 and it was introduced by Lufthansa on 25 January 2016. Re-engined with CFM International LEAP-1A or Pratt & Whitney PW1000G engines and with large sharklets, it should be 15% more fuel efficient. Three variants are based on the previous A319, A320 and A321. Airbus received 6,031 orders by March 2018 and delivered 318 by May 2018. Airbus offers three variants of the A320neo family: the A319, A320 and A321. A New Engine Option for the Airbus A318 is not expected but can be developed if needed.